Today the Los Angeles Rams are hosting the Los Angeles Chargers at the Los Angeles Memorial Coliseum. These are two teams that had unsuccessful seasons last year and wound up with new coaches this year: Sean McVay for the Rams and Anthony Lynn for the Chargers. And then there was that move from San Diego to Los Angeles for the Chargers. It’s a whole new season and era for both teams as they try to get back into the winning column of the NFL. The Chargers have their veteran quarterback Philip Rivers under center today, and he is expected to play much of the first half. The Rams have their second year, first round draft pick Jared Goff starting at quarterback. He too will see a little more playing time as they get prepared for their first game of the regular season against the Indianapolis Colts at home September 10. The Chargers start their season on the road against the Denver Broncos September 11. The Rams have their new receiver Sammy Watkins on the field. He’s been learning the playbook and philosophy of the Rams organization since he came over from the Buffalo Bills August 11. He is the playmaker the Rams are hoping will open up Goff’s passing game. 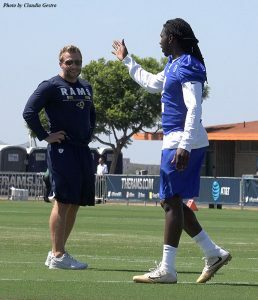 Running back Todd Gurley III has been having a great camp so far and with the new offense of McVay the hope is the Rams running game will be greatly improved over last season They also have another running back in camp that has looked good as well, Malcolm Brown, who is in his second season. For the Chargers, their top running back is still Melvin Gordon II. Going into his third season with the team, Gordon has grown into his role as the primary back as well as a team leader. He’s much more poised than he was in the previous two seasons so fans can expect to see some explosive running from Gordon. Look for him to jump start the Chargers offense when he’s on the field with Rivers. This Chargers defense will have its hands full today with Gurley and Brown and if the Rams passing game gets in gear it will be a long day for the Chargers defense. The Chargers have not had a great preseason offensive. They have scored only two touchdowns and have not scored in the last 17 drives. Rivers only played one series in those first two games, so the scoreless trend will probably come to a halt. One thing fans should not expect is more fighting. The two teams practiced together twice in this training camp and fights broke out between the teams. Coaches and players know that can cost a team a lot of yards in a game. It may only be a preseason game, but for the fans it’s still NFL football. Game time is 5 p.m.